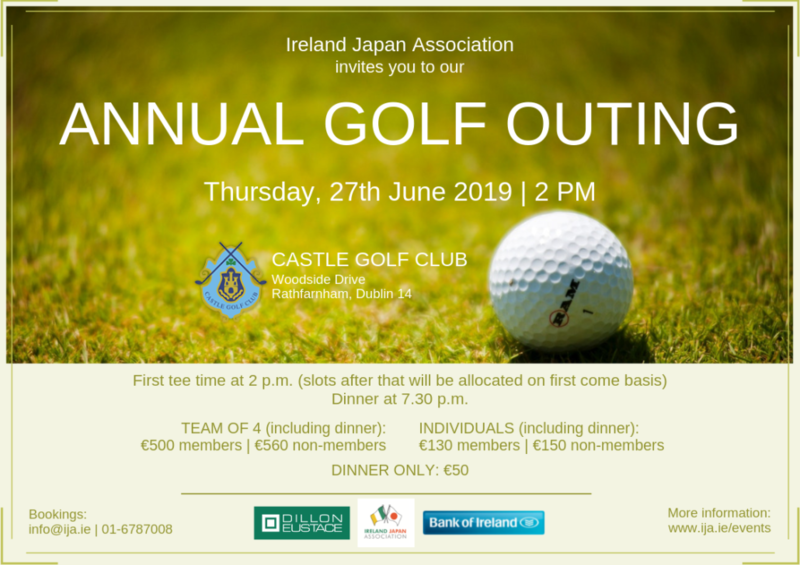 Ireland Japan Association would like to invite you to our Annual Golf Outing that will be held on Thursday, 27th June at the beautiful Castle Golf Club in Rathfarnham, Dublin. Get your teams ready and clean your clubs for an amazing day of golf, networking, and great food & atmosphere at the stunning Castle Golf Course, Dublin. * Arrival from 1.30 p.m.
* First tee time at 2 p.m. (slots after that will be allocated on first come basis). * Dinner & Prize Giving from 7.30 p.m.
To book tickets, please RSVP by Monday, 17th June by email: info@ija.ie or call 01-6787008.